So here’s the thing about eggplant. I don’t really like it. I never have. But my mother seems to think the sun sets and rises on eggplant. As a result, I keep attempting to like eggplant and I keep failing miserably. There’s just something about the bland, jelly-like texture surrounded by chewy skin. And, at times, it’s bitter. I’ve never been a fan of anything prepared a la Parmigiana – which seems to be the main eggplant preparation commonly available. Double yuck. Then there was that fateful day my mother decided to prepared Eggplant Enchiladas. Please understand, my mother is an excellent, quasi-gourmet cook. The magical things that have come out of her amazing kitchen never cease to delight the palette. This dish was not one of them. She spent an entire afternoon working on these horrid little things. I will never forget her proudly serving them to us, with a flourish she presented her new dish….and it fell on quite the deaf audience. We still tease her regularly about them. She liked them, but none of the rest of us did. Here were are, some 15 to 20 years later, and I still challenge myself to find a way to like eggplant. It seems a way to connect to and bond with my mother. Not that I need it, we see each other almost daily and have plenty of other things between us. But, those eggplants have remained elusive and they arrive at my doorstep somewhat regularly due to our weekly veggie bag. 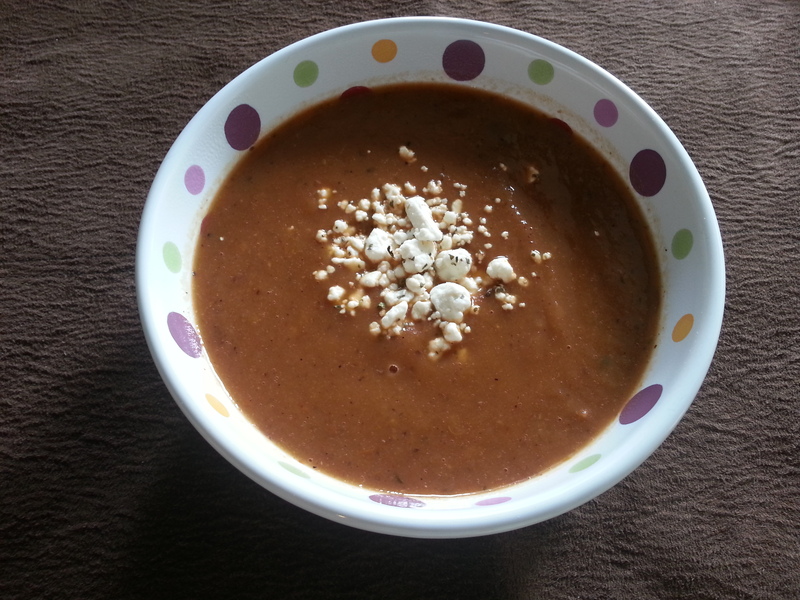 This time, though – I opted to make a roasted eggplant, vegetable and garlic soup and it turned out AMAZING! Finally! An eggplant dish I can welcome with open arms. This was based on the particular vegetables I had on hand and I’m quite certain the ratios of vegetables can be changed and substitutions easily made. This is my new, “throw everything in the pot” go to dish. First, roast the vegetables. Preheat the oven to 400 Fahrenheit. 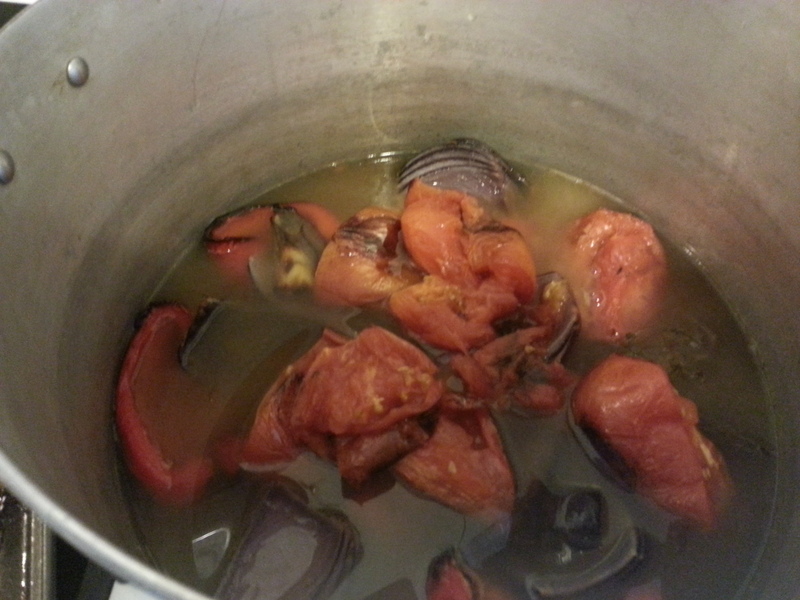 Halve the eggplants, quarter the tomatoes, red onion and red pepper. Arrange on a baking sheet, drizzle with olive oil and sprinkle with kosher salt and pepper. Feel free to season with your herbs of choice as well. The garlic requires a bit more prep work. Remove most of the outer skins and trim the tops of each clove, drizzle with olive oil and salt, wrap in aluminum foil, place on baking sheets. I used Simply Recipes to show me how to roast garlic. Bake for 35 – 45 minutes until all vegetables are tender. 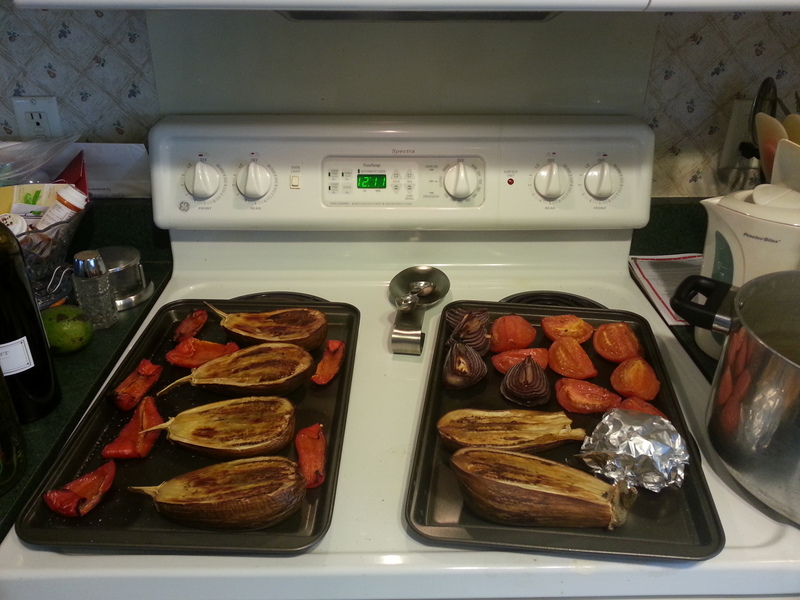 Vegetables roasted, fresh from the oven! Place thyme and vegetable broth in a big pot on the stove. I’d start with 6 cups, but you may need more depending on how many vegetables you have. Scoop the eggplant out of the skin, scoop the garlic cloves out of their skins and place all of the vegetables in the pot. Feel free to season with the herbs of your choice, but I recommend avoiding fresh fennel. This soup turned out so wonderfully, I decided to make a second batch and threw in some fresh fennel I had on hand. Big mistake. It was terrible. Trust me, don’t do this. Bring to a boil and then simmer, 45 – 60 minutes until all is tender. Remove the thyme sprigs. Puree either by using an immersion blender or, in batches in a blender or food processor. Return to pan, warm through. At this point, I added a sploosh of dry red wine, because I am inherently incapable of not adding whatever wine I’m drinking to whatever food I’m cooking. I’ve seen others add cream or milk to these types of soups at this stage. I found mine was creamy and rich enough and didn’t add any. But if you like your soup a wee bit heavier, go for it.